Messy. Clumsy. Volatile. Exciting. These words are not often associated with the sciences, which for most people still connote exactitude, elegance, reliability, and a rather plodding certainty. But the real story is something quite different. The sciences are less about the ability to know and to control than they are about the unleashing of new forces, new capacities for changing the world. 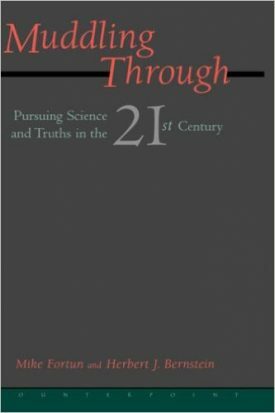 The sciences as practiced exist not in some pristine world of “objectivity,” but in what Mike Fortun and Herb Bernstein call “the muddled middle.” This book explores the way science makes sense of the world and how the world makes sense of science. It is also about politics and culture—how these forces shape the sciences and are shaped by it in turn. Think of Muddling Through as the basic text for a new kind of literacy project, a project to re-imagine the sciences as complex operations of language, action, and thought—as attempts, trials, limited experiments. The sciences provide us with the images and metaphors we apply to myriad situations and phenomena, and create the blueprints we use to make and legitimate crucial social decisions. If democracies are to meet the challenge of the ever more critical world-making role of the sciences, they must fundamentally shift their attention and their attitudes. The quest for social or political mastery of the sciences will have to end; the new journey will begin with a trip to the muddled middle. Travel then, with historian Fortun and physicist Bernstein from the workshops of fifteenth-century England to a present-day quantum physics laboratory. Stop at a military toxic waste dump, a courtroom, a colony of baboons. Along the way you might shed your faith in pure inquiry, see the limits of value-free rationality, and breath the fresh air of change. MICHAEL FORTUN is a historian and anthropologist of the life sciences. HERBERT J. BERNSTEIN is a professor of physics and served as a visiting scientists at the Massachusetts Institute of Technology from 1984 to 2004.